Emma Clifford (Tanya), Helen Hobson (Donna Sheridan) and Gillian Hardie (Rosie) in Mamma Mia! UK Tour 2017. Photo by Brinkhoff M+genburg. It has taken me a while to pluck up the courage to venture into a theatre to see Mamma Mia!, the hugely successful jukebox musical inspired by the songs of ABBA. After all, it first hit the Prince Edward Theatre in London's West End on April 6, 1999, before spreading like wildfire around the world, playing to audiences in more than 50 countries in all six continents. It didn't sound like my cup of tea at all and I was subsequently traumatised by the 2008 film adaptation which took my scepticism to new heights. I was dragged along to that and scarred for life by the sight (and sound) of none other than James Bond, one Pierce Brosnan, attempting to sing. But I was amazed how much I enjoyed last night's performance, at the start of the Sunderland leg of the show's UK Tour. It was a laugh-out-loud, lively, foot-tapping romp of a musical that transported you back to '70s and off to the sunshine on the Greek islands. If you want some light-hearted, escapist entertainment, some great songs and even a chance to dance, Mamma Mia! presses all the right buttons. Yes, the show is more cheesy than a feta salad, but it doesn't feel as contrived as the movie, the acting is far more natural and the mega-hit tracks are more cleverly woven in. It was made for the stage and, in my opinion, should have stayed there. There's a smart plot - Sophie Sheridan has lived with her mum Donna on the island of Kalokairi for all of her 20 years and is preparing to marry fiancé Sky. Although she is desperate for her father to walk her down the aisle, she doesn't know who he is. When she finds her mum's old diary and reads about some intimate dates with three men, Sam Carmichael, Bill Austin and Harry Bright, around the time she would have been conceived, she decides to invite them all to the wedding in an attempt to discover the truth. It explores family relationships, identity and love, and was played with tenderness by Lucy May Barker (Sophie) and Helen Hobson (Donna). They both sang their hearts out against a loud orchestra and just about won the battle. We were all rooting for the vulnerable characters by the end and they delivered in emotional bucket-loads. 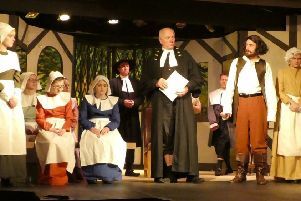 They were ably supported by the three 'fathers', Peter Saul Blewden (Sam), Christopher Hollis (Bill) and Jamie Hogarth (Harry), who were not afforded the same sympathy but delivered their roles with dutiful aplomb. Stealing the show, though, were effervescent Gillian Hardie and vivacious Emma Clifford, who played Donna's former band-mates Rosie and Tanya, giving them an excuse to perform some of the ABBA songs whose lyrics didn't quite fit into the plot. The audience was warned from the outset to expect some platform boots and white lycra - Super Trouper was their moment to appear. There were some priceless scenes - the two numbers sung by Donna, Tanya and Rosie in Donna's bedroom really had the pulses racing and feet tapping - Chiquitita and Dancing Queen, complete with hairdryer and brush 'microphones' - really got the party started. Other highlights included the lads dancing in flippers to Lay Your Love on Me - for flapper girls, substitute flipper boys; an uplifting crescendo to end the first half (Voulez Vous); the inventive nightmare sequence to start the second half (Under Attack); the hilarious attempts of Pepper (an excellent Morgan Jackson) to woo the sultry Tanya to the strains of Does Your Mother Know; the raw emotion of Helen Hobson's rendition of Winner Takes It All brought many a tear to many an eye; and, of course, the all-action, vibrant finale (Mamma Mia, Dancing Queen and Waterloo, thrown in for good measure and presumably because it would fit anywhere else!). ABBA were the ultimate Marmite band - you either loved or loathed them - although there were many who secretly admired them, happily danced to their tunes down at the disco, but were too afraid or cool to admit it. But their success was phenomenal, topping the pop charts worldwide from 1974 to 1982 and selling up to 500million records, depending on which figure you believe. There was no denying their song-writing prowess was shown off to the max and the Sunderland crowd took them to their hearts and had a ball. I loved it! If you're in any doubt, go on, take a chance on me, and book your ticket.